Which One is REALLY the Biggest? The amusement industry is filled with a lotta hype. Every year, it seems, amusement parks brag about building the world's fastest roller coaster or the world's tallest ride, even though they can't all break records. Similarly, indoor water parks love to boast, including the Water Park of America (America's biggest! ), Fallsview (North America's largest! ), and The World Waterpark (North America's largest!). There are multiple claims to the same titles, but they can't all be the largest. So, what gives? Let's try to dissect the claims and get to the truth. We'll focus on the square feet of the indoor water parks as the primary indicator of size and the claims to be the largest. There is one park that, ahem, blows all of the others out of the water. The champion of the world—timpani, please—is Tropical Islands in Brand, Germany. Housed in a hangar structure designed for, of all things, a zeppelin, it spans over 710,000 square feet and is the largest freestanding building (never mind water park) in the world. It can accommodate up to 7000 visitors. Tropical Islands offers a variety of attractions in addition to its indoor beach and water rides. Regardless, it easily qualifies as the world's largest indoor water park. Long before the hotels in Wisconsin Dells kicked off the indoor water park phenomenon and resorts started battling it out for bragging rights, the West Edmonton Mall in Alberta, Canada, opened World Waterpark. At five acres, or roughly 225,000 square feet, the mall's water park is larger than any other indoor water park in North America, with the possible exception of the Wilderness in Wisconsin Dells (which we will discuss later). World Waterpark is the largest indoor water park in the continent under one roof. Unlike all of the other parks included in this feature, however, it is not a water park resort. A standalone water park, it is one of the attractions at the West Edmonton Mall (which also includes Galaxyland, an indoor theme park). But the mall does offer some onsite hotels, so it could be argued that the mall itself is one giant resort. The Kalahari Pocono Mountains in Pennsylvania expanded in 2017 and doubled the size of its water park to 220,000 square feet. That's just a few thousand square feet shy of Canada's World Waterpark. The Kalahari is the nation's largest indoor water park under one roof. Let us explain. The Wilderness in Wisconsin Dells spreads its indoor water parks among four separate buildings. The combined square footage of the three indoor water parks in the main part of the resort (which guests can access by padding through its labyrinth hallways) stands at 205,000 square feet. The Wilderness Territory resort includes the nearby, but detached Wilderness on the Lake. It offers its own small indoor water park, Cubby's Cove. 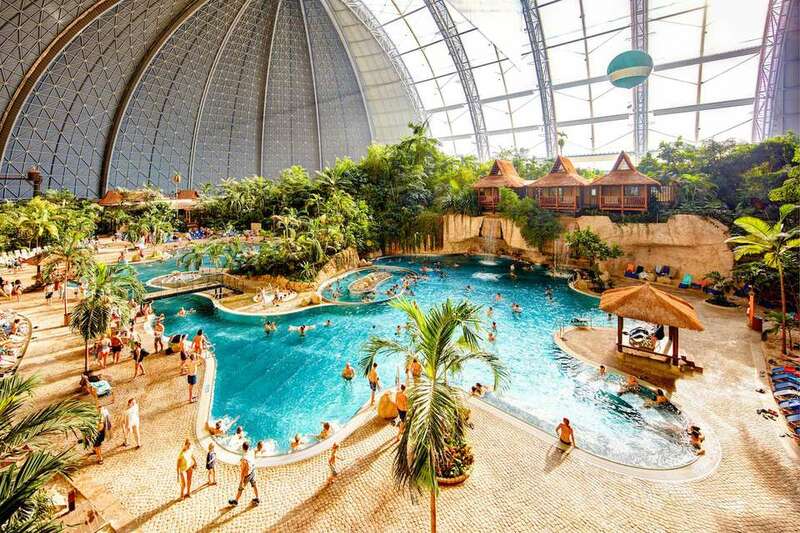 Adding the fourth water park to the total puts the combined square footage of the indoor water parks at the Wilderness at 240,000 square feet, which would make the Wilderness bigger than the Kalahari and World Waterpark. But it is a bit strange that its parks are not all in one place. The Kalahari is about to lose its bragging rights as the largest indoor water park in the United States to...the Kalahari. The chain of indoor water park resorts announced that it will be opening a new location in Round Rock, Texas in 2020. The 350-acre property will include about 1,000 hotel rooms, a 200,000-square-foot convention center, an indoor family entertainment center with rides, and a 223,000-square-foot indoor water park. That will barely eclipse the Kalahari in Pennsylvania and almost (but not quite) match the size of the World Waterpark in Alberta. "North America's largest waterpark hotel." That was the claim made by Fallsview Indoor Water Park in Niagara Falls. Before it opened, Fallsview's developers said that it would be 90,000 square feet. As it was being built, its designers added a mezzanine and outdoor pool which brought the total up to 125,000 square feet. Hang on a sec. We've already established that there are North American indoor water parks that are bigger. The Fallsview folks, however, claimed their complex included 1200 affiliated hotel rooms, which was the most hotel rooms of any indoor water park resort. So, the park is not the largest in square footage (although it is large); it's the largest in terms of the number of hotel rooms. Whew! That's a stretch. Note that despite its relatively large size, Fallsview doesn't have the number or variety of water attractions, nor the marquee slides and rides that indoor water parks of similar size offer. Another park that once claimed to be "the biggest indoor water park in America" was the Water Park of America, near the Mall of America. At 70,000 square feet, the Minnesota park was certainly big, but it didn't come close to approaching the size of some of the country's biggest indoor water parks. Great Wolf Resorts has since purchased the Water Park of America and rebranded it as a Great Wolf Lodge indoor water park resort. The centerpiece of the Water Park of America was its audacious 10-story tall water slide complex, the tallest of any indoor water park (and one of the tallest of any water park, outdoor or indoor). So, it's fair to say that it was the tallest indoor water park, but it's a leap to call it the "biggest." There are other enormous indoor water park resorts, many of which rival well-stocked outdoor water parks in terms of the number, variety, and flashiness of its slides and attractions. At 173,000 square feet, Kalahari in Sandusky, Ohio was the country's largest indoor water park for many years, until the chain topped itself at the Kalahari in the Pocono Mountains. Two of the biggest and best (and among the industry's early pioneers) are in the water park capital of the world, Wisconsin Dells: Kalahari at 125,000 square feet and Chula Vista at 110,000 square feet. Aquatopia at Camelback Lodge in Pennsylvania is 125,000 square feet. The largest properties in the Great Wolf Lodge chain are Great Wolf Lodge Garden Grove in California at 121,000 square feet and Great Wolf Lodge Niagara Falls (on the Canada side) at 103,000 square feet.